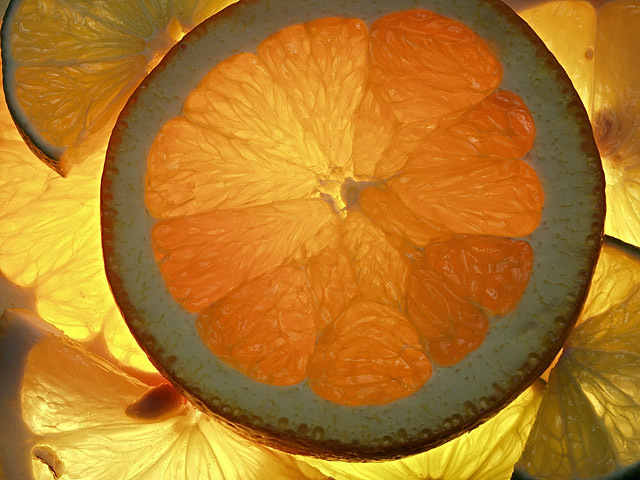 Orange,lemon and lime slices set on glass lit from below with lamp and above by window light. AND, holds my eye on it. The crop could have been more centered. Nice colours and lighting. I wonder whether the top of the central slice should have been included ? Whereis a small number of fruits and veggies. congratulations - this photograph contains a fruit and/or a vegetable, therefore it meets the challenge! well done! nice close up and details ... but i think it should be brighter if you're going to use 'sunshine' as your title! nice effort though. 6! colors are very nice. composition is sort of a jumble. Love the warm tones of the oranges and yellows in this one. Illuminating the sliced portions of the fruit such that the light shines through not only gives us a view of all the lovely details of the fruit BUT it also gives us a warm sunshiny feeling. Proudly hosted by Sargasso Networks. Current Server Time: 04/23/2019 12:17:50 PM EDT.